The space shuttle Endeavour sits atop Pad 39A at NASA's seaside Kennedy Space Center launch complex for a planned 7:17 a.m. EDT (1117 GMT) liftoff on June 13, 2009 on the STS-127 mission to the ISS. CAPECANAVERAL, Fla. - The space shuttle Endeavour is "go" to launch anambitious mission to the International Space Station on Saturday, NASA managerssaid today. "We'rein really good shape to fly," said Mike Moses, Endeavour?s missionmanagement team chief, in a briefing here at NASA?s Kennedy Space Center. "As a management team we had a good unanimous "go" forlaunch." The weatheroutlook is near perfect for the shuttle's planned liftoff 7:17 a.m. EDT (1117GMT) from the seaside Launch Pad 39A here. Endeavour?s seven-astronaut crew isalso eagerfor launch. Shuttleweather officer Kathy Winters forecasted a 90 percent chance of favorableweather for Saturday. The only concern is the slight chance of clouds over thelaunch pad, which could trigger lightning. "Theweather does look very good for launch," she said. "We also look verygood if we happen to delay." Endeavouris slated for a 16-daymission to deliver a porch-like experiment platform for the station?sJapanese Kibo lab and other gear to the International Space Station. TheSTS-127 mission's seven crewmembers, led by veteran astronaut Mark Polansky,are sleeping in today to prepare for their nocturnal mission schedule. They arescheduled to wake up tonight at 8:15 p.m. EDT (2415 GMT). Mission specialistsChris Cassidy and Julie Payette, who represents the Canadian Space Agency, planto conduct practice flights in NASA?s T-38 training jets tonight. Theastronauts plan five tricky spacewalks and a series of challenging robotic armoperations to install the new piece of the Kibo laboratory, as well as a set ofspare equipment for the space station. WithEndeavour's crew onboard, theorbiting station will host a record number of 13 people at once. The spacestation doubled its population to a full, six-person crew last month. "It'slike having your family descend on you for the holidays and they're gonna stayfor a verylong time ? and they're going to bring all their stuff," Moses said. Since theshuttle crew and station crew trained together before launch, Moses expectsthings to go pretty smoothly. "I think what we're going to see is probablysome unprecedented efficiencies," he said. IfEndeavour is unable to launch Saturday, NASA can try again on Sunday or Monday.The weather looks 90 percent favorable for a 24-hour delay, and 80 percentfavorable on Monday. After that,the shuttle must stand down to make way for a pair of unmanned lunar spacecraftset to launch towardthe moon on June 17 from the nearby Cape Canaveral Air Force Station,mission managers have said. 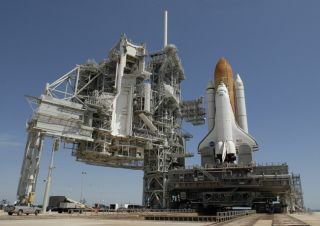 If the shuttle cannot launch in June, the nextopportunity for Endeavour will open up on July 11. Endeavour'sofficial launch countdown began early Wednesday, and preparations are goingsmoothly to get the vehicle ready to lift off. SPACE.comwill provide complete coverage of Endeavour's STS-127 mission with staff writerClara Moskowitz in Cape Canaveral, Fla., and Senior Editor Tariq Malik in NewYork. Click here for live coverage,mission updates and a link to NASA TV.